In this screencast, you will learn how to signup for the free version of the Boardroom Web. 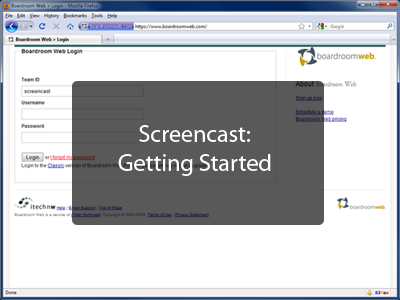 In this screencast, you will learn how to get started using the Boardroom Web. Learn how to create a new user, add a user to a meeting space, and create a message within a meeting space. In this screencast, you will learn about the various features within the Boardroom Web. This high level screencast briefly covers all of the features.